We’d love your help. Let us know what’s wrong with this preview of Socks by Nick Sharratt. Laugh your socks off! Stripy sharks and woolly crocs, Purple dogs with polka dots! What can you see made from Socks? Kids (and grownups!) will love this socktastic celebration of the nation's favourite footwear. Look out for sockerels, sockodiles and Goldisocks, and prepare to see your socks in a whole new light. To ask other readers questions about Socks, please sign up. So much funny and punny and silly! Hipposockamus! Socktopus! Sock Ness Monster! Sockalicious! so hilarious! It go my mind churning for more rhymes, puns, jokes, etc. Silly story with Seuss-esque silly words. Loved the artwork! I would have given this a 3-star rating, but it was really successful at storytime. The only thing I didn't like about it was the inconsistent formula for the first line. Most of it starts with sockywockydoodah, but every now and again it's sockywocky-something-else, which would have been fine if it had been more formulaic. But I'm pretty sure none of that matters to the real audience of the book, so, 4 stars! A fun, silly book that has all the kids pulling off their shoes. 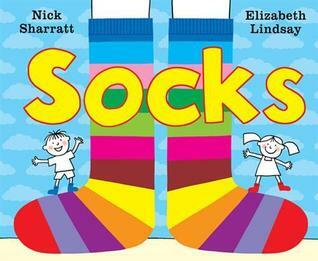 Socks is written by Elizabeth Lindsay and illustrated wonderfully by Nick Sharatt. 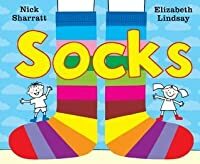 Socks is a perfect book for EYFS. A book about a world made out of socks! The book rhymes with a whole load of made up words and fun words to read from socksophones to goldisocks. A great laugh and read to enjoy an energetic and fun filled story telling session. This book is so silly and hilarious that I knew it would appeal to my young kids and sure enough it did. 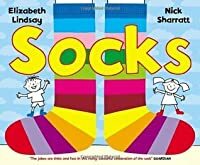 The colors are brilliant, the way the socks are used will appeal to a child's sense of fun, and the word play is wonderful. A celebration of everything stocky! Every item starts with sock... Even if it never has before. Bright, attractive and funny pictures. Lots to make you smile! Nick Sharratt is the author-illustrator of numerous books for children, including The Foggy, Foggy Forest and Dinosaurs’ Day Out. He lives in Brighton, England.